Two differing polls predict a tie between Labor, Likud - but who would have an easier time forming a coalition? Labor and Likud are still neck-and-neck for the top spot, according to a poll released Thursday, just days before the 20th Knesset elections. Both parties would receive 24 seats according to the Channel 1 poll for the "Mabat" program with Ya'akov Eilon, followed by Yesh Atid in third place with 13 seats. The Arab list would gain 12 seats, followed by Jewish Home with 11. Moshe Kahlon's Kulanu party also falls behind Shas for the first time, with Shas at 8 seats, and Kulanu at just 7, the same as United Torah Judaism (UTJ). Bottoming out the poll are Yisrael Beytenu with 6 seats, and Meretz and Yachad - Ha'am Itanu with 4 seats each. Likud and Labor are also neck-and-neck in a separate poll published Friday - but, in this set of results, support is slightly higher for likely Likud coalition partners Jewish Home and Ha'am Itanu. 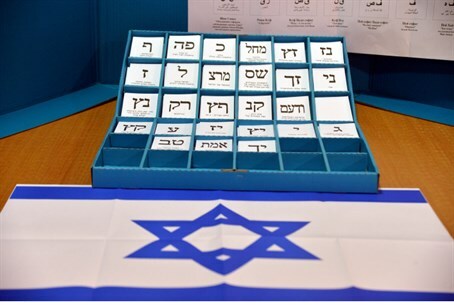 Likud and Labor would gain 23 seats each if elections were held today, according to the Yisrael Hayom poll, with Yesh Atid and the Arab parties at 13 seats each and Jewish Home at 12. Kulanu follows at 9 seats. Shas, United Torah Judaism, and Yisrael Beytenu have six seats each, and bottoming out the poll are Meretz at 5 seats and Ha'am Itanu at 5. This survey also predicted a slight gain for the right bloc in terms of forming a coalition, predicting a bond between Likud, Jewish Home, the haredi parties, Ha'am Itanu, and Yisrael Beytenu at 57 seats; with Kulanu, it would pass the 61-seat mark at 66 seats for a stable government. On the other end, the Left may face difficulties. A pact between Labor, Meretz, and Yesh Atid only garners 41 seats; with the Arab list, it would approach the 61-seat threshold at 54 seats, but fall just short even with Kulanu's support (at 60 seats). Yet another poll published Friday - this time, by TNS for Walla! - also predicts a close race between Labor and Likud, with Jewish Home consistently falling in all polls. Labor and Likud each garner 24 seats, according to these results, with Yesh Atid and the Arab list at 12 each. Jewish Home would gain just 11 seats, followed by Kulanu and Shas at 8 each and UTJ at 7. Bottoming out this poll are Yisrael Beytenu, with six seats, and Ha'am Itanu and Meretz at 4 each. Respondents were also asked who they would prefer for prime minister, with 47% voting for Prime Minister Binyamin Netanyahu, and just 30% preferring Labor leader Yitzhak Herzog.